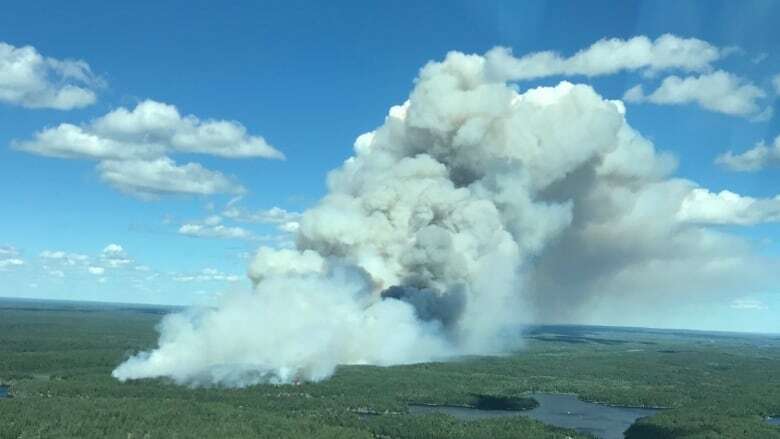 Fire crews in northwestern Ontario have set up a base camp in Minaki, Ont., to help battle Kenora 71, a wildfire that has grown to more than 9,000 hectares and is still listed as out of control. Twenty five crews, or approximately 100 firefighters from Ontario, Saskatchewan, Alberta, the Northwest Territories, and the Great Lakes region of the United States are working out of the base camp, said Chris Marchand, fire information officer with the aviation, forest fire and emergency services fire centre in Dryden. Crews plan to start using aerial ignition - the process of intentionally setting small fires to burn away fuel - in order to prevent the large fire from spreading, he said. Water bombers and heavy bucket helicopters are already on the scene. Wabaseemoong First Nation has evacuated more than 45 elderly members, young children, people with respiratory problems, due to air quality issues caused by the fire. Kenora 71 is currently burning about 23 kilometres north of Wabaseemoong and is not considered a physical threat to the community, Marchand said. There are structures in the area of the fire, such as trappers cabins and outpost fishing cabins, which crews are protecting with sprinklers, he added. Travel on the Werner Lake Road east from the Manitoba border is currently prohibited. There are currently 77 fires burning in northwestern Ontario, Marchand said, including several fires of more than 3,000 hectares in Woodland Caribou Provincial Park. The park has closed 26 lakes to back country permit-holders due to the threat from the fires, and Marchand said firefighters are protecting cabins with sprinklers. More fires are expected in the Red Lake area, he said, due to lightning in the past 24 hours. One new fire, Red Lake 128, was triggered by lightning Sunday evening, he said. The fire, which is approximately 33 kilometres north west of the community currently has one crew fighting it with help from air attackers. Crews are not expecting it to become a problem, Marchand said. Another new fire, Nipigon 44, near Wabakimi Provincial Park also has a crew fighting it with help from a helicopter, he added. It's expected to be out within 24 hours.